Do you dread having to clean out the gunk in your gutters? If so, you’ll likely be excited to learn that gutter guards from AAA Window – Siding Roofing will eliminate the need to balance atop the old ladder and scoop out various plant matter in your gutters. 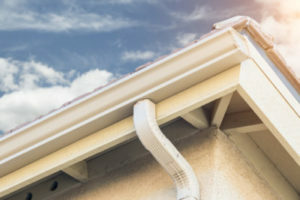 We offer a couple of different types of gutter protection products to choose from, both of which will keep leaves, twigs, and other debris from entering your system and causing blockages. We even offer a gutter guard that is available in different colors so you can find one that complements the look of your Lincoln, Illinois, home. Additionally, these gutter guards are engineered to withstand winds up to 90 miles per hour and won’t blister, peel, or split. They are also guaranteed not to fade for 20 years. When you turn to AAA Window – Siding Roofing, you can rest assured our very own skilled employees will handle the installation for you. Our commitment to professional installations has earned us a number of accolades throughout our more than 30 years in the industry, including being included in Qualified Remodeler magazine’s Top 500 remodelers list multiple years in a row. What’s more, if you want to update the gutters on your home before you have gutter guards installed, we can assist you with such a project. We sell and install premium aluminum gutters that are long lasting, so you can feel confident they’ll channel heavy rainfall and snowmelt away from your home and beautiful landscaping. Are you ready to learn more about the gutter guards and additional products we offer to homeowners in Lincoln and throughout other communities in Central Illinois? If so, contact AAA Window – Siding Roofing today. We’ll be delighted to answer any questions you have.